"As I recently became vegan, I remembered the creaminess of dairy mashed potatoes. 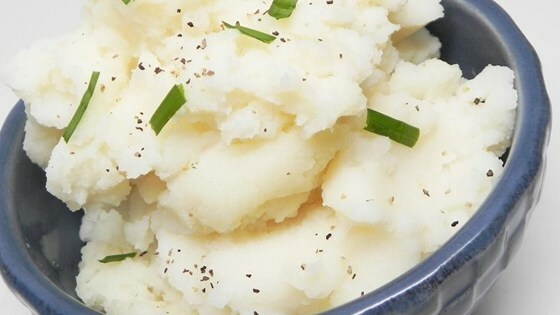 I was not satisfied with other vegan mashed potato recipes, so I created my own. These are as good, if not better, than the mashed potatoes I used to make. No one would ever believe they are vegan." 1Place potato chunks and bay leaf into a large pot and cover with water; bring to a boil. Reduce heat to medium-low and simmer until tender, 10 to 15 minutes. Drain and transfer to a large bowl. 2Combine soy milk, vegan mayonnaise, vegan margarine, Parmesan-style topping, salt, and pepper in a microwave-safe bowl. Heat in 30-second intervals until margarine is melted, 1 to 2 minutes. 3Pour soy milk mixture over potatoes in the bowl; mash until smooth with a potato masher. Add more vegan Parmesan-style cheese for cheesier potatoes.